Celebrate spring with easy lamb meatballs made with fresh mint and cilantro. Serve them with cheesy mashed potatoes to keep the comfort-food quotient high. Bring salsa and 2 cups water to boil in large saucepan, stirring occasionally. Meanwhile, mix stuffing mix, meat, onions, eggs, mint, cilantro, garlic and remaining water in large bowl. Shape into 24 balls, about 1/4 cup each. Drop meatballs gently into boiling salsa mixture; cover. Simmer on medium heat 18 to 20 min. or until meatballs are done (165°F). 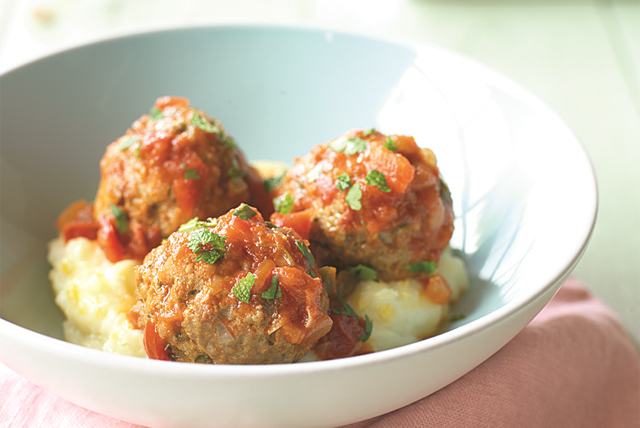 Stir cheese into mashed potatoes just before serving; top with meatballs. Serve with your favourite steamed vegetable to round out the meal. Use a small ice cream scoop with a release mechanism to easily shape the meat mixture into balls. The scoop lets you shape the meatballs without using your hands so there's less chance of spreading bacteria from the raw meat around your kitchen. Remove cooked meatballs from pan; cover to keep warm. Bring sauce to boil until it reaches desired consistency, stirring frequently. When purchasing ground lamb, always check the label to ensure that the meat has been ground on the day of purchase. If you can't use the meat immediately, wrap it tightly and freeze until ready to use. For best quality, use within 2 months.